I managed to find a second hand Tokina 10-17mm fisheye, as I mentioned in my post about the surf photography kit I want in the future, this has been the lens of choice for many surf photographers shooting with a Canon cropped sensor body (e.g. Canon 7D, 40D, 60D etc.). 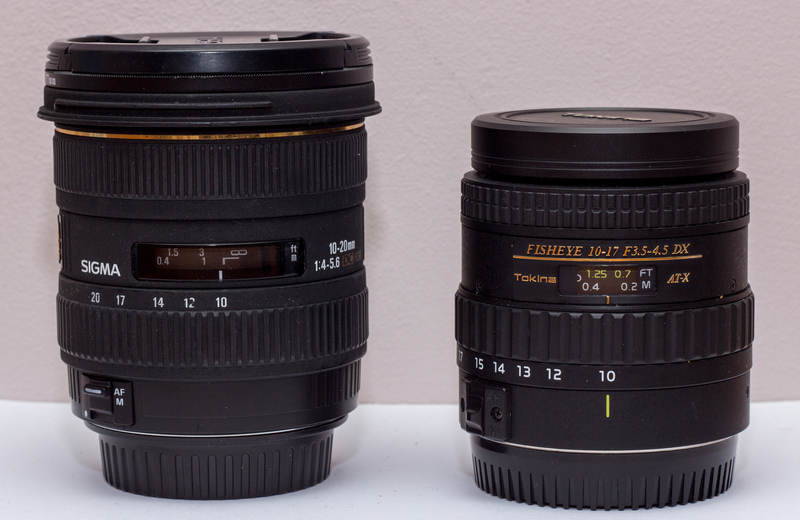 This post is a quick comparison between the Tokina AF 10-17mm F/3. 5-4.5 AT-X 107 DX Fish Eye and the Sigma 10-20mm f4-5.6 EX DC HSM wide angle lens, it’s not technical or in depth, just some basic details and observations that are relevant if you’re learning surf photography and want to shoot in the water, or if you’re just looking for a wide angle lens in general. Price – Buying new from Amazon the Sigma costs about £370 and the Tokina is about £520. Availability – You can get both of them new fairly easily but the Sigma is definitely more popular so it crops up much more frequently second hand. Distortion – The Sigma is a rectilinear wide angle lens, so it doesn’t bend straight lines, they remain straight. The Tokina is a fisheye so you get more distortion as you move away from the centre of the frame, straight lines appear curved at the edge of the picture. Minimum focusing distance – important for shooting underwater with a dome port, the Tokina can focus closer at 14cm, the Sigma is rated at 24cm. Maximum Aperture – for surf shots you’re mostly interested in the 10mm end, you get a max aperture of 3.5 for the Tokina and 4 for the Sigma. Range – The Sigma has more, 10-20mm as opposed to 10-17mm. Size – The Tokina is smaller, they weigh about the same, they will probably fit into the same dome port for whatever housing you might want. Filters – You can easily get 77mm filters for the Sigma but the built in lens hood on the Tokina means you have to do a bit of DIY to get filters on it. Available for Nikon and Canon. I use a Canon 60D and the only camera I am thinking of getting at the moment is the Canon 7D, they both have cropped sensors, but many surf photographers shoot with a full frame body like a 5D mk II or III instead (or as well). A lot of lenses designed for smaller sensors can get in the way of the mirror mechanism of full frame cameras, I’ve done some searching and I have tested both on my Canon EOS 500 35mm SLR, and as far as I can tell you can use both of these on a full frame body with no danger of damage being done. Based on what I found on line and my experiments with my 35mm EOS the Sigma has some pretty big vignetting at the corners at 10mm that disappears at about 14mm, and with the Tokina you can see the built in hood in the image until about 14mm too. Some people have ground the lens hood off the Tokina for use on a full frame body at wider angles, and the re-designed version does away with the built in hood for exactly this reason. Here are some shots I took in my garden to show the difference in field of view, there’s a 9 foot soft board about 1.5 metres away from the camera, the camera is on a tripod a couple of feet off the ground. Here they both are at 10mm, you can see the Fisheye effect on the Tokina distorting the straight lines and allowing a wider field of view. The shots below were at 17mm, you still get some distortion at the edges of the frame, this can be corrected using software if you wish, but it’s not as useful as an all-round lens as the Sigma. I’m a little surprised by how much extra you can see in the Tokina shots, they’re both 10mm after all but the fisheye does give you that bit of extra coverage which I think makes quite a difference when shooting in the barrel. Here are a couple of shots taken in the sea, unfortunately I don’t have the resources to get two camera set-ups side by side to compare so you’ll have to make do with a couple of fairly similar shots from different days. This isn’t really that useful but at least you can see a couple of action shots, I tried to pick two which were shot on similarly miserable days, I think it shows that there’s not much in it between the two lenses, so the field of view and distortion are the real deciding factors. I haven’t really used the Tokina enough to know about the fine image quality details but I’m impressed with what I’ve seen so far, suffice to say that neither are likely to be as good as the Canon 8-15mm L fisheye but they’re both plenty good enough for me, I’ve been lucky enough to have one of the pictures I shot with the Sigma printed in Carve and I’ve had other shots blown up pretty big and they look really good to my (amateur) eye. I am going to be selling on my Sigma and keeping the Tokina, for surf photography it’s great, sharp, a bit faster for low light, and more housing manufacturers cater for it specifically with ports. However, the Sigma is definitely a more versatile lens, I’ve used it for shooting video, large groups of people at weddings, and lots of general photography as well as surf shots and it’s performed really well. If the main use for the lens is not close up action sports photography the Sigma is a great choice. Glad this was useful to you, I definitely recommend the Tokina 10-17mm on a cropped sensor, I recently picked up a Canon 15mm fisheye too which I’ve done a bit of testing with on my cropped sensor 70D, full frame 5D mk II (not mine unfortunately) and a 35mm Canon body, so I will be doing a comparison between the Tokina and Canon options in the future too.